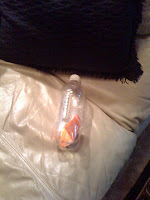 So, when I arrived home last Friday night, I walked into my living room to see this on my couch. Naturally I called out to the one I felt sure was responsible with a tone that said, "You have done it now, mister." Because that what us moms do, right? After instructing Tyler to come throw away the empty bottle he left on the couch, he let me know right quick that HE was not the guilty party. It was his sister who broke the cardinal rule, Do not leave your trash behind for someone (namely me) to have to pick up. Tyler was innocent, but I accused. The Word of God calls Satan an accuser too. In Revelation, he is accusing. In the book of Job, he is accusing. Hitler wrote a book that detailed his plan to conquer Europe. The wisest thing his enemies could have done was to read it. What's the wisest thing we need to do? Read the Word so we too can understand our adversary because he for sure is reading us... everyday. We need to get into the Word to learn not only about our God and ourselves, but also about the one who is coming to steal, kill and destroy our very lives. I accused Tyler based on his past. I thought He left the bottle because he is forever leaving his trash behind. Satan will accuse and use our past sins as well to drive us deeper and deeper into despair. But know this, your past sin may be what you did, but it is not who you are. Perfect? No. God never said you had to be. Loved by God in spite of ourselves? Yes!! So when Satan comes around throwing accusations, tell Satan to put THAT in his pipe and smoke it!! A great big Thank You to every lady who commented and emailed your thoughts and suggestions for our upcoming class She Grows! !